Professional After Builders in London. No deposit for booking. The price is fixed. For a quick, non-binding and free price quote, contact our 24/7 customer care operators. Call 020 3746 0000 or use the online contact form here. 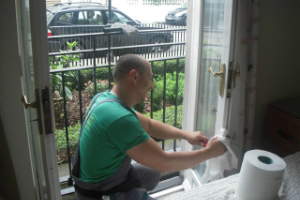 Our professional cleaning company Thomsons Cleaning has been providing the domestic and commercial residents of London with various cleaning and maintenance services, some of them specialised. The after builders cleaning service is especially meant to help private and business clients to quickly and efficiently clean up all the dust, builders waste, debris and paint and plaster splatters from the renovated or newly constructed home, office or other property. We can also offer you builders waste removal, deep carpet and rug cleaning, upholstery cleaning, and all other cleaning services along with this one. If you choose to book more than 1 service, we will give you a very serious discount from the price. This specialised cleaning service is hourly based. You are the one who decides what you want cleaned and what you can do by yourself. Our cleaners can give an estimate of the hours necessary for the cleaning to be completed once they come to the address. You decide how many hours to book. Our vetted and experienced cleaners will come equipped with all the professional cleaning equipment, tools and solutions necessary to bring your property back to its normal self even after serious reconstruction work has been done. We use only Prochem certified, safe and efficient cleaning solutions. We can provide you with high quality and quick debris removal, plaster and paint removal from ceilings, floors, carpets and other surfaces, removal of the dust, hovering, floor polishing, deep kitchen and bathroom cleaning. You can pick which tasks you want done first for the hours booked. Save yourself the effort and time, and book our professional after builders cleaning service today! In order to book our specialised one off after construction cleaning service, first of all the builders in your home or office need to be done with all of the refurbishments and renovations. Call 020 3746 0000 or send us an online booking request right now. Our customer support centre accepts booking requests and can answer your questions about the service 24/7. No deposit is required for ordering the service. The price for the after builders cleaning service is fixed and is hourly based. You will pay only after the cleaning is completed. If you order more than one of our services at once, we will give you a big discount. Regular customers, estate agencies and landlords get preferential prices, and so do customers who book early on. Book now, and make your home or office liveable quickly and hassle free!